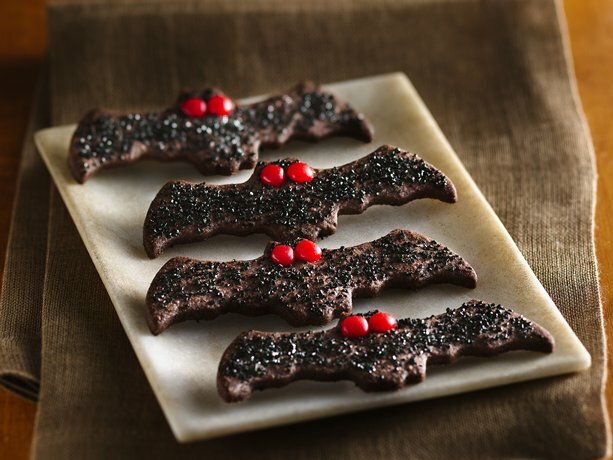 Yummy Bat Cookies, look at these cute little spooky cookies! In large bowl, beat butter, granulated sugar, egg and vanilla with electric mixer on medium speed, or mix with spoon. Stir in flour, cocoa and salt. Divide dough in half. Flatten each portion into a disk. Wrap in plastic wrap; refrigerate 1 hour. Heat oven to 375°F. On lightly floured surface, roll one portion of dough at a time 1/8 inch thick. (Keep remaining dough in refrigerator until ready to roll.) 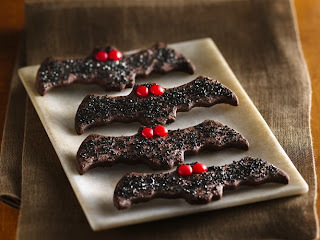 Cut with 4 1/2x1/2-inch bat-shaped cookie cutter. (If dough becomes too sticky to cut, refrigerate 10 minutes before rerolling.) Place 2 red cinnamon candies on each cookie for eyes. Sprinkle with sugar crystals. On ungreased cookie sheet, place cookies about 1 inch apart. Bake 8 to 10 minutes or until edges are set. Cool 1 minute; remove from cookie sheet to cooling rack. Outline the edges of the bat with black decorating gel for more detail. When shopping for black decorator sugar crystals, you might find it labeled as black sanding sugar.